NOTE : this edition of Random Shots was expanded for a more complete tribute to Barbara Edmonson's life and work. The online version also contains hyperlinks to relevant pages here at www.pre-pro.com and elsewhere on the web. It’s difficult to adequately express in words the impact that this “guide” and its successor had -- and continues to have -- on those of us who collect old shot glasses. As a friend recently wrote me, “did she know how many people hung/hang on her every word?” Sadly, Barbara Edmonson died in November last year, shortly after reaching her 92nd birthday and after a lifetime of career and personal achievements. Those of us who appreciate old glasses lost a great friend. I’d like to use this edition of Random Shots to celebrate her accomplishments and legacy. Barbara Edmonson was born Barbara Ann Turner on October 15, 1912 in Kansas City, Missouri. She was the eldest of three children. Prohibition was enacted when she was seven but even so, she recalled frequent lunchtime visits to speak-easies with her father while her mother was back home brewing beer in the kitchen! I was also amazed to learn that as a teenager, Barb became one of the region’s first female pilots. After graduating high school, she moved on to college, but quickly tired of it and returned home. She then joined her father at his sporting goods store in the city, working as a traveling sales rep. When the US was dragged into the Second World War, Barb joined the Foreign Economic Administration and was sent to Turkey. The FEA was a government body established in 1943 to oversee wartime imports/exports, foreign aid, and various other activities such as economic warfare. When her service with the FEA was over, Barb returned home and found herself a position working with young children. She became interested in child psychology as a result and then began a long period of academic training, securing first a B.A., then an M.A., and finally a Ph.D. She also married Milton B. Edmonson during this time (1951), though the couple divorced 12 years later. Barb’s fascination for shot glasses surfaced while living in Columbus, Ohio. 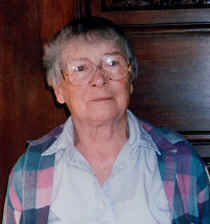 After gaining her Ph.D., she joined the faculty of Ohio State University as an Associate Professor teaching Psychology. In her free time, she would scour flea markets for interesting collectibles that she would then resell at antique shows. Paul Van Vactor remembers first meeting her when setting up a table next to hers at a show in Ann Arbor, Michigan, sometime in the late 60’s or early 70’s. 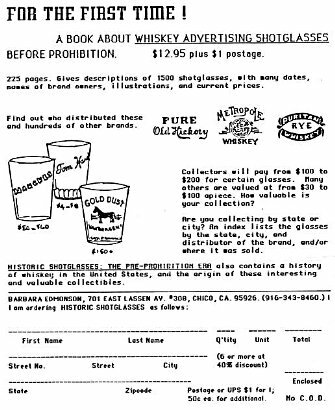 She had a special affection for pre-prohibition glasses, partly because of the quaint names of the brands that they advertised and perhaps also because they reminded her of her childhood years in Missouri.